Bhagavad Gita itself can give us Love of Godhead! 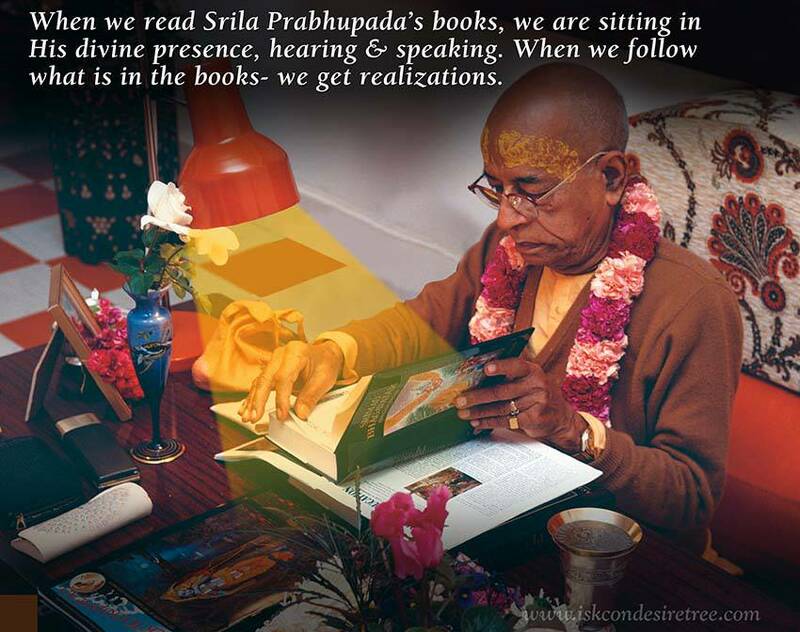 Prabhupada: That I’ve explained many times: a pocket dictionary and international dictionary. You cannot say that pocket dictionary is no dictionary, but it is meant for a certain class of student. And international dictionary is meant for a certain class of student. They are all student. Was Christ… What was spoken by Christ, that is also God consciousness, but that was meant for a certain class of men. And what class of men they were? They’re not even perfectly civilized. Because Christ was explaining God consciousness, that was his fault, and they crucified him. What class of men they were? Judge. His only fault was that he was explaining God, and they crucified him. The reward was crucifixion. So what kind of class of men they were? The status of that society, just try to understand. Therefore what spoke…, what was spoken by Lord Jesus Christ, for them, that was sufficient. But when Bhagavad-gétä is spoken to a person like Arjuna, that is different thing. So we have to speak according to the time, according to the circumstances, according to the audience. Bhagavad Gita is the highest standard of God consciousness. Don’t you see that here only a few persons are attending? Why? They cannot understand this Kåñëa science, Kåñëa consciousness. It is not meant for all classes of men. It is highest standard of God consciousness. Love. Love of God. So there is also teachings of love of God, undoubtedly. That is the difference. The same thing. Always try to understand. The small pocket dictionary for students while in the primary stage, and international dictionary for higher students, postgraduate students—the both of them are dictionaries. But it is meant for somebody, it is meant for somebody. What would the test of such a high scripture? And the test is phalena paricéyate. Phalena paricéyate, you have to understand. Suppose you are traveling in a forest. So many trees are there. But you cannot understand what is this tree, what is that. But as soon as you see the flower, “Oh, here is apple. Oh, this is apple tree.” Just like the other day you were telling me, you never saw apple tree? Yes. Now, as soon as you saw the apple, you understood, “This is apple tree. 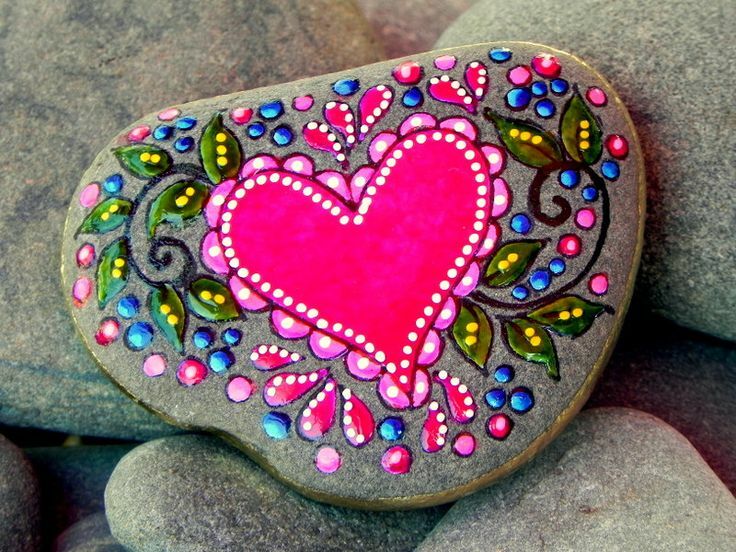 Oh!” The test of any scripture is how one is developing love of God. Phalena paricéyate. If you find that following some religious principles you are developing your love of God, then it is perfect. It doesn’t matter whether it is Bible or Koran or Bhagavad-gétä. It doesn’t matter. We have to see what is the fruit. If the fruit is that people are developing love of Godhead, then it is perfect. Don’t try to understand whether this is good, this is good, this is bad, this is… No. Try to understand by the result. 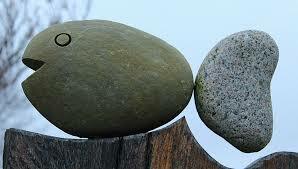 Just like the same way: if you see the fruit, then it is first class. Love of Godhead should be the goal of all practitioners of every religion. One should therefore learn Bhagavad-gītā from a devotee of Kṛṣṇa, not from mental speculators. This is a sign of faith. When one searches for a devotee and fortunately gets a devotee’s association one actually begins to study and understand Bhagavad-gītā. By advancement in the association of the devotee one is placed in devotional service, and this service dispels all one’s misgivings about Kṛṣṇa, or God, and Kṛṣṇa’s activities, form, pastimes, name and other features. After these misgivings have been perfectly cleared away, one becomes ﬁxed in one’s study. Then one relishes the study of Bhagavad-gītā and attains the state of feeling always Kṛṣṇa conscious. 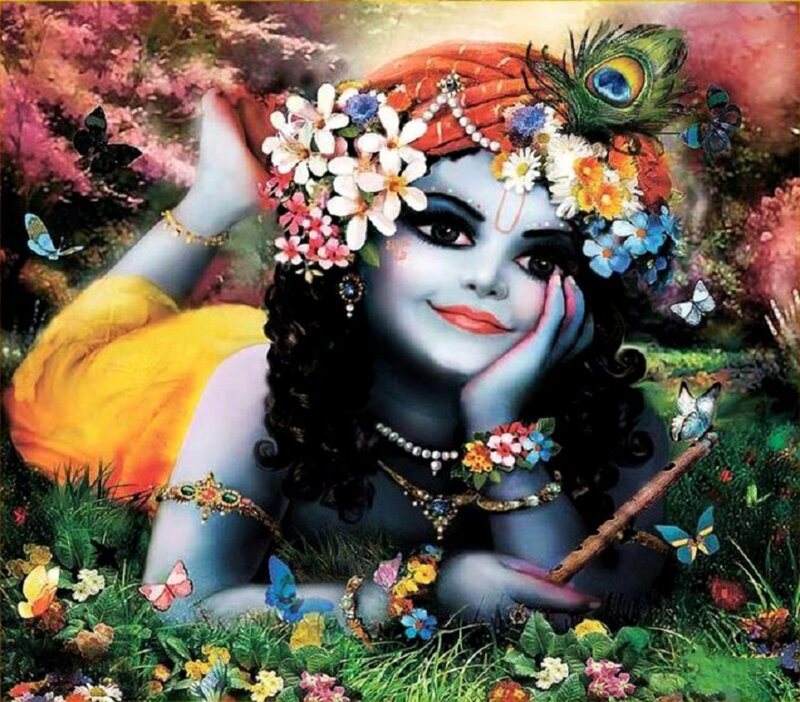 In the advanced stage, one falls completely in love with Kṛṣṇa. This highest perfectional stage of life enables the devotee to be transferred to Kṛṣṇa’s abode in the spiritual sky, Goloka Vṛndāvana, where the devotee becomes eternally happy. 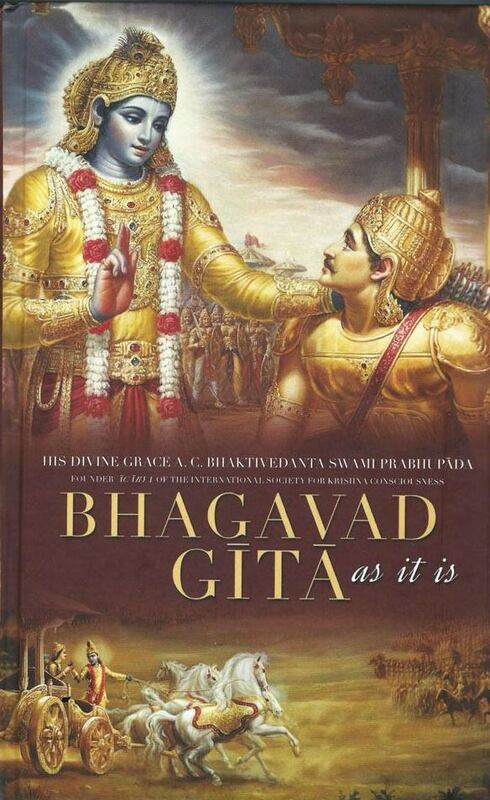 Today is Gita Jayanti, the most auspicious day when Sri Govindadeva spoke Bhagavad Gita to Arjuna. So it may be a good day to surrender ourselves to this transcendental scripture containing the very words spoken by the Supreme Lord Himself. And we may vow that from this very day I will become a humble servant of Sri Bhagavad Gita. I will serve my master by reading it daily. I will also serve by carefully studying Bhagavad Gita under the guidance of a pure devotee of Krishna and finally I will serve all humanity, considering every single soul to be my fellow brother, by sharing and distributing it without any prejudice or miserliness, by not hoarding the knowledge with myself. Let me pray, and then endeavor hard, to become the servant of the servant of the servant of the Pure devotee, Srila Prabhupada, who shared with us the very essence and purpose of Bhagavad Gita for the benefit of all humanity. Wherever there is Kṛṣṇa, the master of all mystics, and wherever there is Arjuna, the supreme archer, there will also certainly be opulence, victory, extraordinary power, and morality. All glories to Srimad Bhagavad Gita.